Koh-Chang.com is designed to help you organised your travel plans, equip yourself with all the travel information and allow you to make fast and easy hotel bookings for your leisure and holiday travels. Welcome to the Backpackers Information Centre at Haad Rin Beach Koh Phangan Thailand. We offer unique traveller information about South East Asia with excellent tours and packages all over Thailand. Bounty Resort is located on the southern point of Haad Yao beach at Haad Dao Deuk, a tiny private cove with its own white sand beach and secluded sunset views. 4 Star Hotel on Thong Nai Pan Noi Beach. Beachfront Swimming Pool, Air-Con Rooms and Pool Villa. Situated right on Thong Nai Pan Yai beach, Candle Hut Resort provides 40 bungalows with both wooden bungalow and Thai- modern style villa. Every bungalow has air con with comfortable king size bed. Book your room at Coco Hut Beach Resort on Koh Phangan Island. We can offer the best prices and discounts. Drop In Club Resort offers luxury accommodation in the heart of Haad Rin town, with easy access to both Haad Rin Nai and Haad Rin Nok beaches. All rooms come with Air-Con, private western bathoom, hot water, mini-bar, UBC TV and safety deposit box. 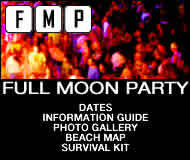 Full Moon Party dates and schedule, hotels, information, half moon party and black moon. Haad Salad Villa beach is one of the most beautiful tourist spots in the north of Koh-Phangan. The beachfront Haad Son Resort is nestled into a tropical hillside, blessed with stunning sea and jungle views and a refreshing sea breeze. Haad Yao Divers is the first PADI 5 Star IDC Dive Resort and only Go ECO Operator on Koh Phangan and is recommended by Lonely Planet. Twice a month, every 1 week before and 1 week after the Full Moon Party. Jungle Gym, Koh Phangan, Thailand provides full training in Muay Thai or Thai Kickboxing, yoga, and other martial arts, a complete fitness center and health food restaurant. Kamala Healing Centre a "tranquil oasis" in the center of Haadrin. Online booking at Mae Haad Bay Resort. The best prices available. Learn to cook Thai food. 3 English speaking professional chefs. Book your room at Neptune's Villa on Koh Phangan Island. We can offer the best prices and discounts. Orion Healing, Koh Phangan Thailand detox resort, yoga, holistics, retreat center. Popular resort on Haad Rin sunrise beach. Swimming pool and air-con rooms. Online reservation for resorts, bungalows and hotels. Information for the full moon party, scuba diving, beaches, property sales & real estate. Useful island maps. Phangan Bayshore Resort is directly on Haad Rin Nok, at the heart of the action most suitable for the Full Moon Party and to enjoy the party nightlife available at Haad Rin. Visit Angthong National Marine Park and the island of Phangan in our purpose-built, all-wood cruiser, Orion. Snorkel among pristine coral reefs and visit the beautiful Emerald Lake. Tours include a traditional Thai buffet lunch. Phangan Buri is located on Haad Rin Nai, the quiet and serene sunset beach on the southern side of Haad Rin town; where all the action five minutes walk away at the famous party beach Haad Rin Nok. Our online clothing store offers you the freshest graphic and the coolest vintage tees.Music-inspired, retro style and fun designs. 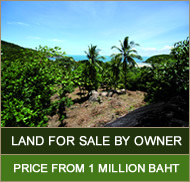 Koh Phangan Property and Land Sales. Wang Sai Grove on Koh Phangan. Our diving center is located on the west coast of the lovely Koh Phangan, one of Koh Phangans best beaches, Haad Salad. RIN BEACH RESORT is located on Haad Rin Nai,with direct access to the pier to Koh Samui and just a few minutes walk to Haad Rin Nok, the beach where the world famous Full Moon Party takes place every month. Siam Healing Centre offers Thai Massage treatments and courses, regular Yoga classes and accommodation. Located on Koh Phangan, Thailand. Paddle board, windsurf and catamaran; courses and rental equipment. Star Light Resort is located on Thong Nai Pan Yai Beach, Koh Phangan where most travelers ranged it in top 5 beautiful beaches on the island. A boutique beach resort on Haad Chao Phao. Air-Con rooms and infinity swimming pool. The Dive Inn offers small groups, personal attention, quality service, professional and unbiased advice and some of the most experienced and qualified staff on the island. Fully air-conditioned modern and clean gym. Wake Up Wakeboarding is a professional organisation specialising in wakeboarding run by wakeboarders, situated in the Gulf of Thailand on the island of Koh Phangan. On the popular beach of Mae Haad and opposite Koh Ma island. Choice of air-con and fan bungalows. Handmade silver jewellery, gems and crystals. Learn to make your own silver jewellery with us on our 1,2 or 3 day courses. The Yoga Studio is located in Thong Nai Pan Yai on the NE corner of the beautiful island of Koh Phangan. Rocky Resort, Koh Samui is a boutique beachfront set in a secluded cove south of Lamai Beach, Koh Samui. We have 28 rooms and Thai villas, friendly and helpful staff, a beachfront restaurant that serves excellent food, two swimming pools, and a relaxed, family atmosphere. When you're at Rocky's, you're family. Koh Tao Diving In Thailand - but not only scuba diving attracts the visitor on Koh Tao. Information about Ko Tao Thailand. Animal Clinic | Conservation Projects | Marine Research | Parties and more. A one stop source of information on Chiangmai and the north of Thailand. A GUIDE TO CHIANG MAI - FLOURISTS, THAILAND WEDDINGS, THAI MASSAGE, THAI RECIPES, TRAVELLING IN NORTHERN THAILAND, TOURS, GOLF AND EVERYTHING IN BETWEEN. Daily dive trips, recreational diving courses, technical diving courses, instructor training, equipment sales, and diver career development in Thailand. Scuba diving instructor training internships and dive career programs. Travel guide including hotels reservation and island information. Phuket hotels and travel guide, local news, nightlife, diving, chat and forums. Official website for Ao Nang Beach, Krabi - Southern Thailand's premier beach resort. Travel guide, hotels, scuba diving and more. Independent Travel Network - Where to stay, play and party! New photos from Thailand island and from south to north Thailand. Experience Thailand beautiful island. Blooming Lotus Yoga offers Yoga Teacher Training Courses, Yoga Retreats and Daily Yoga Classes on the blissful beaches of Thailand. Take the Raja Ferry to/from Koh Phangan and Donsak.